Jade's Journey: Do Children Benefit From Pets? Every child dreams of their perfect pet, a dog or a cat are normally one of the ones that they ask for. I always wanted a dog the cats, rabbits and hamsters just weren't good enough for me. Jared always asks for a pony, something I would love to get for him but I just can't afford the up keep. I think that having a pet is a great benefit for children and an even greater benefit if it is an animal of their choice. Animals are a great way for children to learn, after all one of the first things we teach our children is animal noises! There have been various studies involving children and dogs, one of the studies had shown that children had lower stress levels when around the dog rather than the adults. I know that Jared would rather read a story to the dog then to anyone else. A wide range of animals are also used to aid teaching children with learning difficulties, near to where I live there is a farm where you can visit and they have many helpers who have a disability. Every time we have been the helpers have been very hands on with the animals and they love to tell you all about the animals. Any pet comes with responsibility from cleaning the cage to feeding the fish there is always something. When I used to ask for pets I was always told that I would be responsible for either the feeding or cleaning it depended on what I was getting. I think having a pet is a great way to get children of all ages to have some responsibility, in our home Jared is responsible for feeding Rosie (our dog) I fill the cup up and he puts it in her bowl and checks to make sure she has enough water. Soon we are getting fish which he will also be in charge of feeding. There are so many ways a pet can improve anyone's health. If you have a pet that needs walking or riding then the obvious benefit is that your child will be getting more exercise. In the eyes of my son taking the dog for a walk is seen as exciting because she runs about and plays with him, if I just said shall we go for a walk there would be a grumble or two. Other health benefits include calming anxiety, stress and even lowering the chances of developing certain allergies. Some studies have even suggested that babies and young children who live in a home with cats and dogs could have a lower chance of having asthma. Although this could fall into the same category as educational I felt it needed a section of it's own. As we grow older there is so much that we need to learn and develop, relationships, emotions, social skills etc. The relationship we often tend to build with our pets is friendship, we see them as a friend that we care for and in return they will just listen to us. They can also help with building new friendships, if Jared is playing ball with Rosie we will often get other children wanting to play too. Dogs aren't the only pets to spark a friendship an old neighbour once had a snake and instantly conversation started. When it comes to our emotions if we have a cuddly pet we are more likely to confide in them, I know my dog has licked away many of my tears. 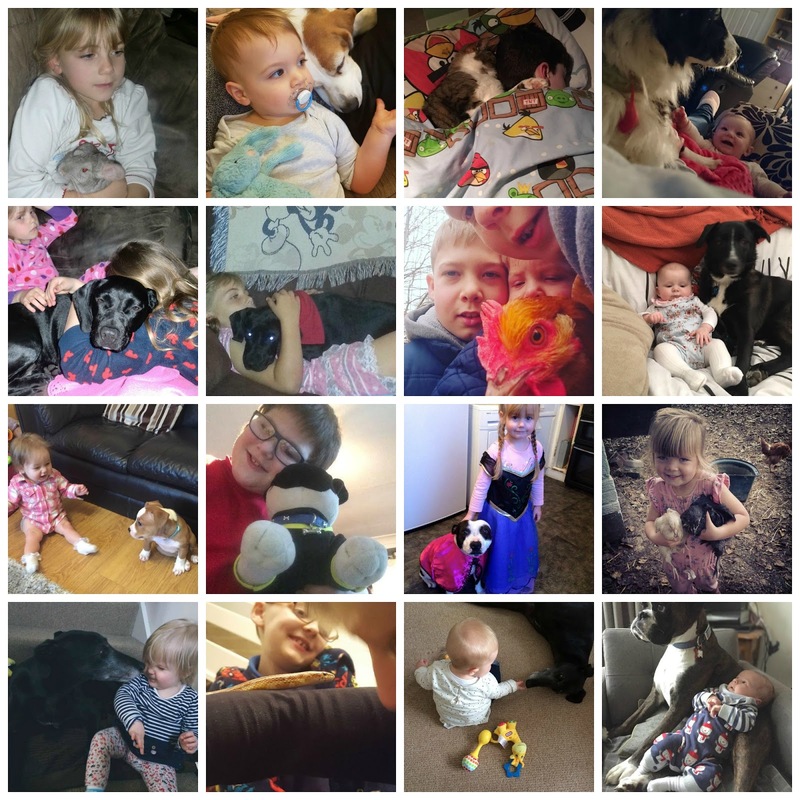 There are so many more benefits but I don't want to ramble on instead have a look at all these super cute children with there pets. 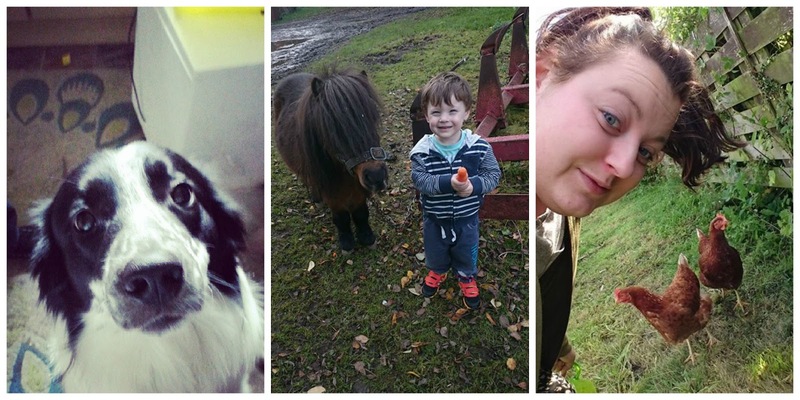 With thanks to the following for sharing their pictures: Hollie from www.thriftymum.com, Sarah from www.amundanelife.co.uk, Jen Mellor, Jaymee Heaton, Kate from www.modernmum.net, Jessica Harvey, Emma Jane, Jamie Speed, Sam from www.myminimonkeys.blog, Jo Dunlop.